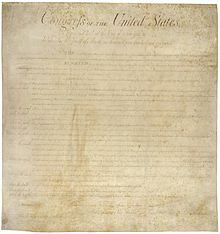 The Bill o Richts (Inglis: Bill of Rights) is the first ten amendments tae the Unitit States Constitution. ↑ "The Charters of Freedom: The Bill of Rights". Washington D.C.: National Archives and Records Administration. Retrieved October 4, 2015. This page wis last eeditit on 31 Januar 2017, at 03:39.